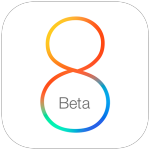 Hot off the heels of the iOS 8.0.2 update, Apple has released the first developer beta of iOS 8.1. The beta build is number 12B401 and presumably focuses on bug fixes and feature improvements to the mobile operating system. iOS 8.1 beta 1 software is limited to those registered with the official Apple Developer Program. Registered developers can log into the iOS Dev Center and find the appropriate IPSW files to update their test devices with. 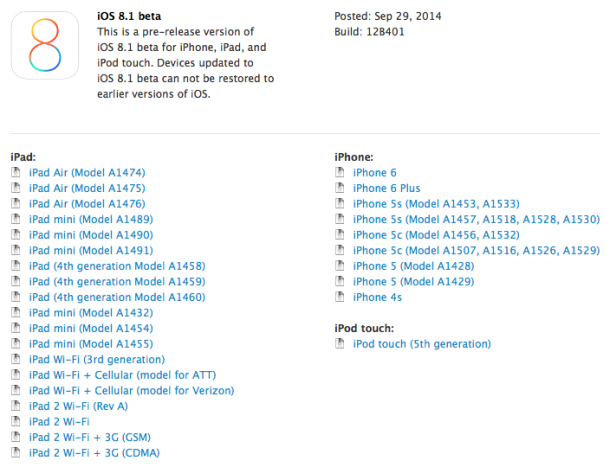 iOS 8.1 beta will run on all iPhone, iPad, and iPod touch devices that are capable of running iOS 8. Though anyone can sign up and pay the $99 annual fee to become an iOS developer, the beta builds are notoriously buggy and incomplete, and are not intended for widespread usage outside of app developers and testing purposes. MacRumors speculates that iOS 8.1 could include support for ApplePay, the NFC-based payments protocol Apple introduced at the iPhone 6 and Apple Watch media event. Apple has said that ApplePay will debut in October. iOS 8.0.2 is basically a beta, it’s so buggy. Can’t imagine this ‘beta’ being any worse. Please tell me is the 3G toggle back too in Beta 8.1 ? Longing to get it back. i know lots who are selling off their iPhones and moving to cheaper android phones ! I wish this important toggle is back. it not only helps in saving battery but also helps in getting a better Cellular Signal if 3g is switched off so the phone latches on to a closer Cell Tower that does not have 3G. It is really needed here in india ! …uh.. it was never gone? I still have that toggle on my iPhone 4S with 8.0.2. And it’s no where near buggy. It is happily chugging along! I have ios8 on my 4s and ‘chugging’ along isn’t how I would describe it… More ‘dragging’ it’s knuckles.